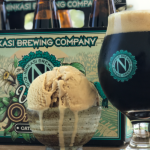 When you crack open a Ninkasi beer, we want to make sure it’s the best beer you could possibly enjoy. We work hard to make sure our wholesale partners and retailers provide you with the freshest Ninkasi beer. How do we do this? Each and every bottle, can, case, and keg of Ninkasi beer is marked with a best by date. We do this to ensure your Ninkasi beer is enjoyed and tastes just as our brewers intended. The best by date is printed on the heel of the bottle. The date is in the format: MON DD YYYY. The best by date is printed onto the upper edge of the long side of the case. The date is in the format: MM DD YY. The best by date is on the bottom of the can. The date is in this format: MM DD YYYY. The best by date is on the side lower corner of the carrier. The date is in this format: MON DD YYYY. The best by date is on the keg collar. The date follows the letters “”BB”” and is in this format: MM DD YYYY. So, what happens if you happen to open a beer after its best by date? After that point, we cannot guarantee the beer will taste as we intended it to. It is important to know that consuming beer after the best by date is 100% safe. Become a Part of our Quality Team! If you do happen to purchase a beer and the best by date has already passed, please feel free to reach out to us, HERE! By sending us details of your purchase, we can make sure to pull all out of date beer and ensure only the freshest beer is stocked in its place. Now that’s what we call teamwork!